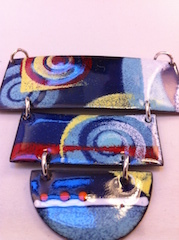 Work on copper, silver or steel, make enamelled jewellery, small tiles or panels. Skills include: enamel application, kiln use, control and safety, foils, stencils, sgraffito, simple cloisonné and other techniques as desired. Absolute beginners welcome. Materials from tutor (£5-£20 dependent upon project). Dorothy Cockrell (Edinburgh www.highamhall.com/dorothy-cockrell) Residential: £231 Non-residential: £164 ENAMELLING WEEK follows.